Rachel Maddow Scores Biggest Ratings Week Ever - Joe.My.God. 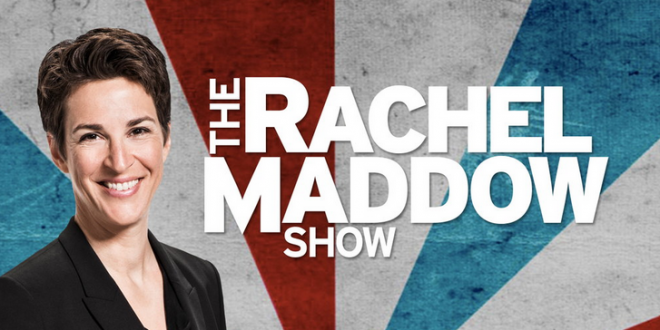 Ratings data released today by Nielsen show Maddow ended the week as the most-watched cable news show for the week, beating out competition from CNN and longtime top-rated cable news network Fox News Channel. Among viewers 25-54, the demographic most coveted by advertisers, Maddow remained on top, with an average audience of 667,000 viewers. Maddow’s ratings often surge when President Donald Trump finds himself under pressure. Last week — with Bob Woodward on a publicity tour for Fear, his stunning White House exposé — was ripe for Maddow’s show. Pair that with Trump’s absurd response to the death toll in Puerto Rico after Hurricane Maria (he questioned it), and Maddow draws eyes.